This badge was issued to Christopher Mun on 16 Apr 2018. The GCTI certification covers Strategic, Operational, and Tactical Cyber Threat Intelligence, as well as Open Source Intelligence and Campaigns, Intelligence Applications and Intrusion Analysis. 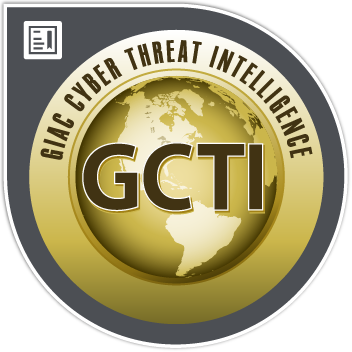 GCTI earners have demonstrated the ability to understand and analyze complex threat analysis scenarios; identify, create and validate intelligence requirements through threat modeling, as well as an understanding of a threat’s behavioral tradecraft through structured analytical techniques.